Welcome to this issue of newsletter delivers you updated info. Thank you for your continuously support to RAYSTAR News. 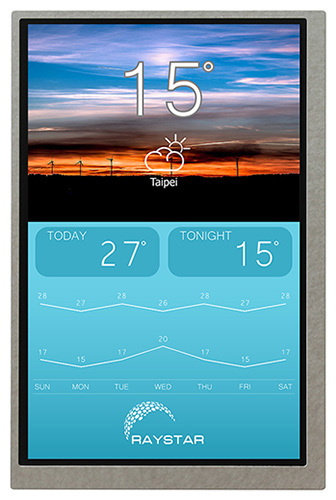 In October, we will introduce 3.5”, 4”, 5” and 7” TFT modules. 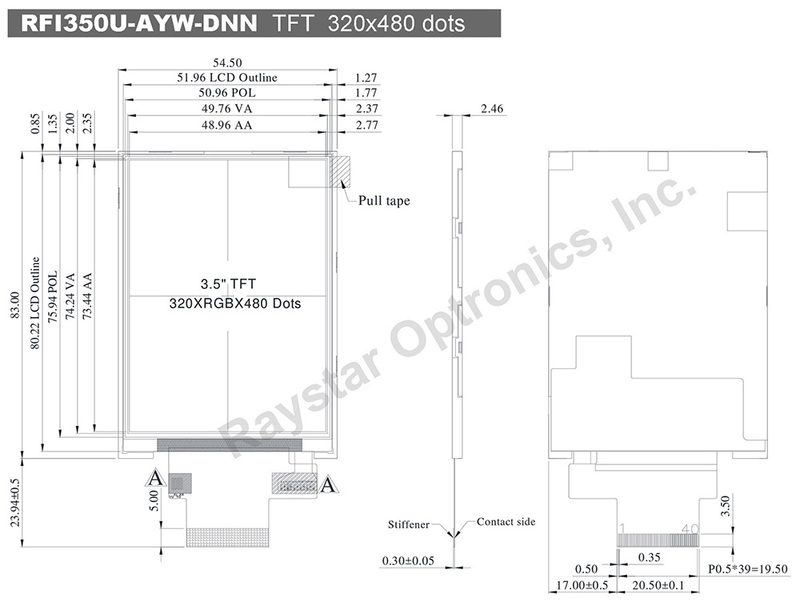 RFI350U-AYW-DNN is a 3.5 inch IPS Panel with 320x480 resolution TFT LCD module. This module is built in with ILI9488 IC; it supports MCU interface and featured with brightness 600 nits (typical value). 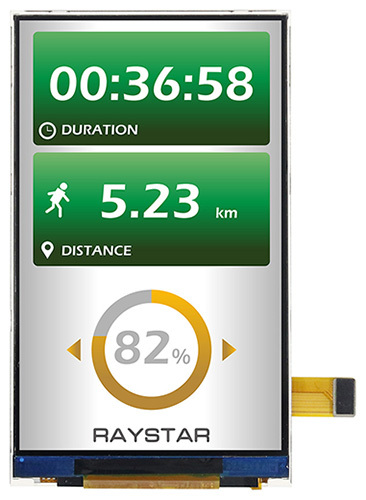 This 3.5" TFT LCD module is portrait mode with IPS (In-Plane Switching) Panel which having the advantages of wider viewing angle of Left: 80 / Right: 80 / Up: 80 / Down: 80 degree (typical). RFI350U-AYW-DNN module can be operating at temperatures from -20℃ to +70℃; its storage temperatures range from -30℃ to +80℃. 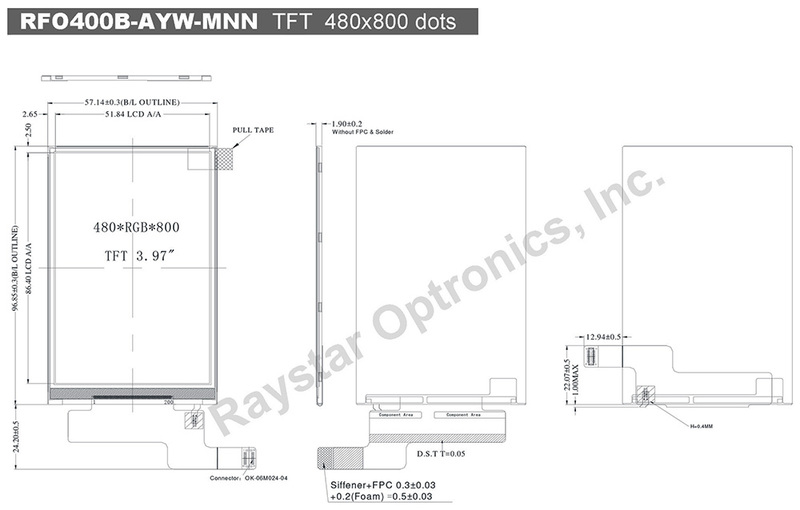 RFO400B-AYW-MNN is a 3.97 inch IPS TFT-LCD module with resolution of 480x800 pixels. This TFT-LCD is featured with IPS panel which is having the advantages of wider viewing angle of Left: 80 / Right: 80 / Up: 80 / Down: 80 degree (typical) and wider temperature. This 3.97 inch module is a portrait mode IPS TFT-LCD; this module is built in with JD9161 driver IC; it supports MIPI interface (Mobile Industry Processor Interface) which is having the characteristics of High Speed Data Transmission and High Speed Clock Transmission. This MIPI TFT display can be operating at temperatures from -20℃ to +70℃; its storage temperatures range from -30℃ to +80℃. 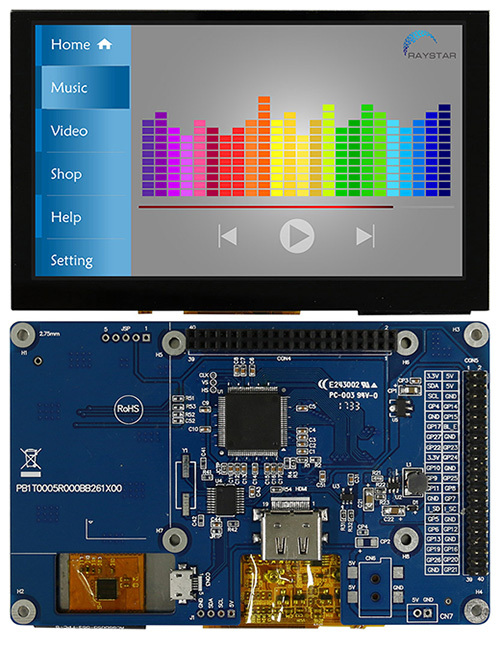 RFF50XB-1IW-DHG is a 5 inch HDMI TFT-LCD module with Projected Capacitive Touch Panel (PCAP); it’s made of resolution WVGA 800x480 dots. This RFF50XB-1IW-DHG comes with a control board with HDMI interface and a 40-pin GPIO connector on board; it is designed to make Raspberry Pi usage become easily. 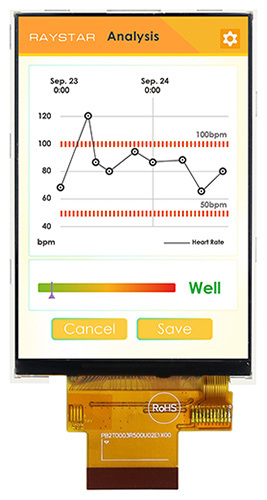 This display has a USB interface Capacitive Touch Screen overlay on TFT panel. We designed a HDMI connector (P/N WWHDMI-00# and USB cable (P/N OTP1XXXXXXXXXXXX0155) for option, the customers can use it to connect RFF50XB-1IW-DHG module with your Raspberry Pi directly. This display is small and compact, you can simply to use it with Raspberry Pi (it supports Pi 1 to 3), and also you can use this display with any embedded system which has HDMI output. The 5" display is 800x480 resolution, which is just enough to run most software, but still small enough that it can be used in portable or embedded projects without the bulk. Please notice, this product RFF50XB-1IW-DHG does not include an HDMI connector or USB cable. 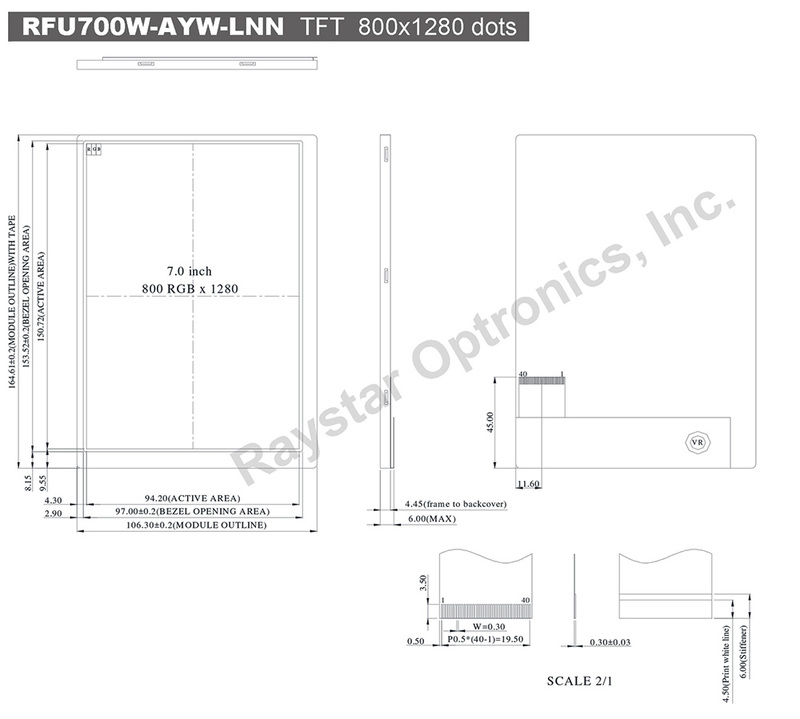 RFU700W-AYW-LNN is a 7 inch IPS Panel with HD 800x1280 high resolution TFT LCD module. 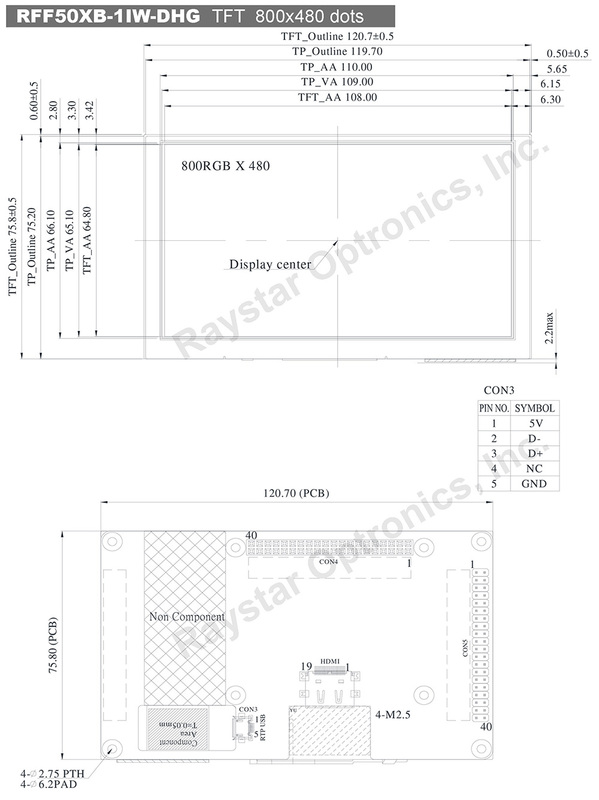 This 7 inch module is built in with LVDS driver; it supports LVDS interface and featured with brightness 450 nits (typical value); it’s having Anti-Glare surface panel and 16:9 aspect ratio. This 7 inch TFT LCD module is portrait mode with IPS (In-Plane Switching) panel which having the advantages of wider viewing angle of Left:85 / Right:85 / Up:85 / Down:85 degree (typical). RFU700W-AYW-LNN module can be operating at temperatures from -20℃ to +70℃; its storage temperatures range from -30℃ to +80℃.